This is another one of those "singles" that would probably be considered an EP by today's standards, as it contains four unique songs, none of which are remixes, instrumentals or acapellas. Whatever you want to call it, this release features reggae-flavored rhymes by Horror City's Superstar and Resident Alien's Double Brain, Dragon and Mister Bug, as well as production by Double Brain, De La Soul DJ Maseo, and someone named Punchie P (possibly a Prince Paul alias). 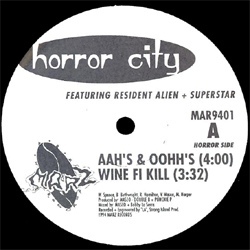 Listen to "Aah's & Oohh's" below, download all four songs here, and check out this post by OG Long Island hip-hop historian Jesse Serwer for more info on the Resident Alien crew. Thanks! More HC posts to come, no doubt. Thanks! I'd love to post some unreleased stuff. Email longislandrapblog@gmail.com when u get a chance.